Of the four cookies in Sister Sanborn’s Hogwarts house cookie challenge, the one that took the most mental energy to create was the Ravenclaw cookie. Which isn’t surprising, since Ravenclaw is known for intelligence, creativity, wit, wisdom, and originality. The cookie to represent the house of Thinkers had to be one that was a bit of a puzzle itself. Flavors that maybe shouldn’t work together, but do. Some of the most rewarding challenges, in baking as well as in life, are those that encourage you to look at common things in a way you haven’t looked before. When we search outside the box, suddenly all kinds of things that shouldn’t be possible become reality. "Can't you?" the Queen said in a pitying tone. "Try again: draw a long breath, and shut your eyes." Alice laughed. "There's no use trying," she said: "one can't believe impossible things." Experimenting with out of the box flavor combinations, or alternate applications for common objects is a good way to practice believing impossible things. And believing in impossible things is the best way to turn the impossible into reality. So when I took on this part of the challenge, I set out to deliberately “believe impossible things.” I started pulling out all of the savory spices from my pantry that I had never thought to use for cookies before, and then I began looking for those surprising combinations that might work. Obviously, the Ravenclaw cookie should have savory elements to please the palate in a puzzling way, but it had to be deliberate, not just a muddied mess of flavors. I thought of the garlic ice cream that I tasted years ago at the Gilroy Garlic Festival. (Seriously, it was the best vanilla-based ice cream I’ve ever tasted – who knew garlic could pair so well with sweet foods??) But a simple garlic cookie didn’t seem right either. This cookie needed layers of complexity … and what better way to achieve layers than with a sandwich cookie? One that paired multiple flavors – flavors that worked together in smaller combinations (garlic and basil, garlic and lemon, lemon and vanilla …), but wouldn’t generally be found all at once. So here it is: a sandwich cookie that combines two different, but complementary, slightly-savory cookies into one surprisingly sweet treat. Spread vanilla buttercream frosting on the bottom of one lemon basil cookie. Press together with one garlic chocolate chip cookie. Repeat until all of the cookies are paired into a batch of puzzling, yet utterly delicious sandwich cookies. Mix in eggs, baking powder, basil, salt, and lemon extract. Beat until light and fluffy. Add flour, and mix thoroughly to combine. Form into ½-inch balls, place on parchment-lined cookie sheet, and press flat slightly. Bake at 400 degrees for 8 minutes, until slightly golden brown around the edges. Cool completely on wire cooling rack. Set aside to assemble Ravenclaw cookies. *Variation: If baking as a stand-alone cookie (not part of the Ravenclaw sandwich cookie), you may wish to stir in 1 c. craisins before portioning the dough. Add eggs, baking powder, garlic, salt, and vanilla. Beat until light and fluffy. Mix in flour, then stir in chocolate chips. Form into ½-inch balls, place on parchment-lined baking sheet, and flatten slightly. Bake at 375 degrees Fahrenheit for 8 minutes, until edges are just lightly golden brown. Transfer to a wire rack to cool completely. Set aside while you make the buttercream frosting. If you don’t want to make your own, you can buy it from the store, but homemade is so easy to make and tastes so much better! Mix in vanilla extract and food coloring. 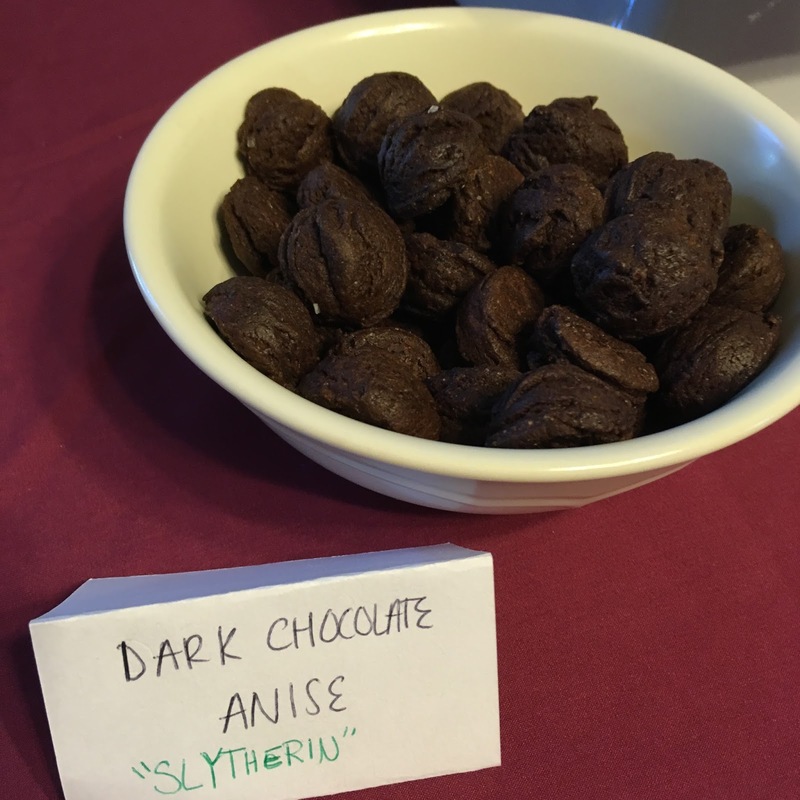 When it came time to create the Slytherin cookies for the Hogwarts house cookie challenge issued to me by Savanna Sanborn (who was serving as a missionary for the Church of Jesus Christ of Latter Day Saints – the Mormons – in Baltimore, MD), I knew immediately what the cookie would be. Even before I consulted my Harry Potter experts to verify the mood of the house. Since Slytherin is known for an edge of darkness, I knew it had to be a dark chocolate base, with something unexpected, simple in execution, yet complex in flavor profile. But I’ve come to understand, in talking with my Harry Potter fanatic friends, that Slytherin isn’t the “evil house,” as it’s sometimes portrayed. There is a hint of sweetness, and a lot to admire about those in this particular Hogwarts house. but she’s also fiercely determined and won’t stop when fighting for something she believes in. I absolutely admire that in her. Obviously, to create a cookie with the perfect balance of simple, yet complex flavors … darkness, with a hint of sweetness … all wrapped up in strength and power, there was only one flavor combination that would do: dark chocolate and anise (black licorice). It’s a flavor that not everyone enjoys, but those of us who do love it wholeheartedly. Add eggs, baking powder, salt, and anise, and beat at high speed until light and fluffy. Mix in cocoa powder until fully combined. Beat in half of the flour, then add remaining flour, one cup at a time, beating in between each addition. Roll dough into ½-inch balls, and flatten slightly. Bake at 400 degrees Fahrenheit for 7-8 minutes.